My nan's original recipe called for sweet potatoes to be included in the dough, this add subtle sweetness but I find it to be quite heavy for an after meal puddings so I have decided to leave it out and make a lighter version instead. To compensate for omission of the sweet potatoes, I have added some caster sugar to give the dough that mild sweetness. Disaster strike when I first made this for the supperclub. As these had to be make fresh, I woke up early on the day to make them. All went well and I set the prepared uncooked ondeh ondeh aside while I got on with the rest of the prep work. But when I returned to them, they had soften and all the Gula Melaka/palm sugar appeared to have melted. So off they went into the bin and the started the whole process again. This time, I omitted a step which I thought might have caused this - parboiling half of the dough and mixing them back in. Although this help to create a softer and stickier dough which made the whole filling process easier but since I will not be cooking them until right before serving, I left out this step. And lord and behold, it worked! And I later found out that it made no significant difference to the ending product. They were so well received that for my second supperclub, I invented my own modern take on this traditional kueh. There was a drink that we used to have as a child called Bandung, made with rose syrup and evaporated milk. So I've decided to utilise this familiar flavour and turn the normally green Ondeh Ondeh into balls of pink yumminess. And I was rather glad to say, these went down a storm too. * My nan's original recipe included 300g sweet potato, cut into chunks, steamed and then mashed. Omit the caster sugar if you are using these. Using a pair of scissors, cut the pandan leaves into small pieces and blend in a food processor with the water into a green pureé. Pass through a sieve to remove the pulp, leaving just the pandan juice and reserve. 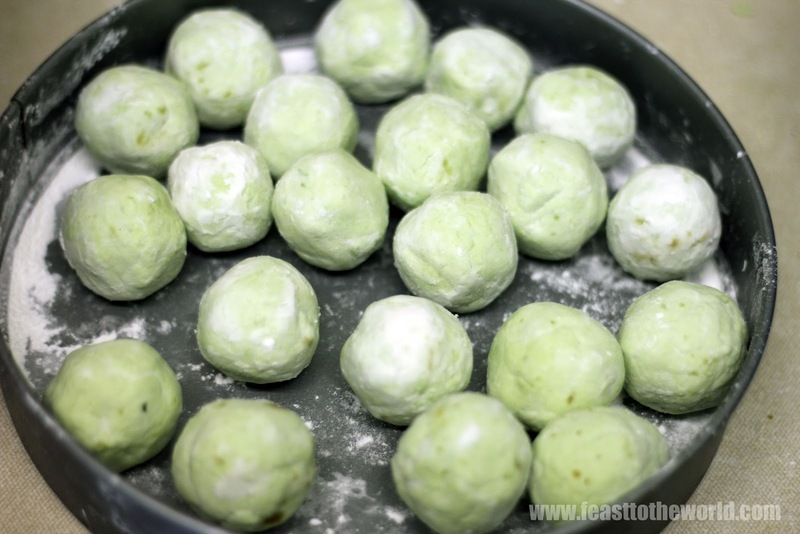 In a large bowl, combine the glutinous rice flour, mashed sweet potato (if using), caster sugar with the pandan juice/rose mixture and knead lightly to bring the flour together into a soft dough. To make the ondeh ondeh, pinch a small piece of dough and roll into a ball, no bigger than the size of a ping pong ball. Flatten into a disc and make an indentation in the middle with your thumb. Fill with a teaspoon of grated palm sugar and roll them in your palm to form a smooth ball, sealing the filling completely (Note: If it is not well-sealed, the palm sugar will ooze out during the boiling). Repeat with the rest. Bring a large pot of water to the boil and add the ondeh ondeh balls. They are cooked once they float to the surface, about 3 - 4 minutes. 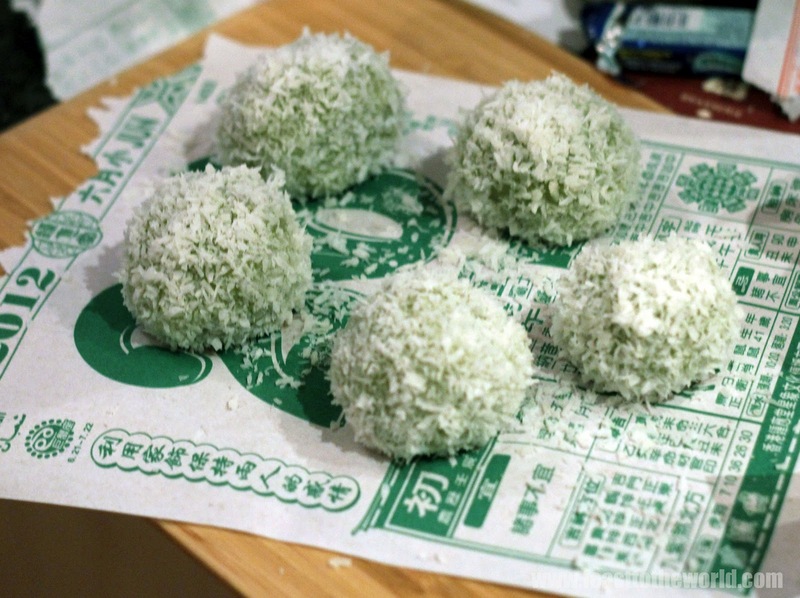 Remove with a wire mesh ladle and roll them in the desiccated coconut to coat. Serve immediately and wait for the oozy gula Melaka centre to dribble down the chin. 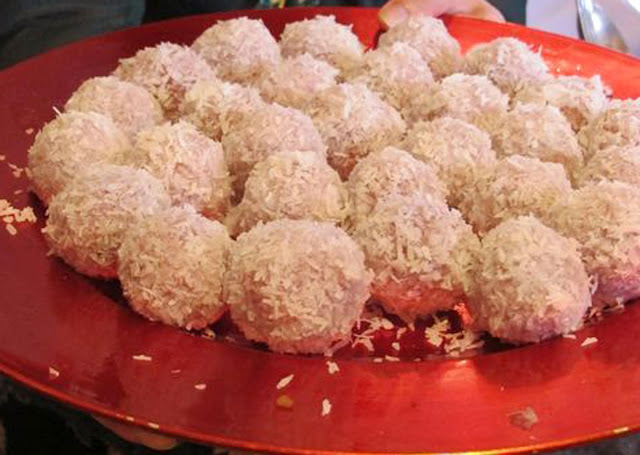 YUM...These look amazing like mochi but filled with palm sugar!! WANT!!! 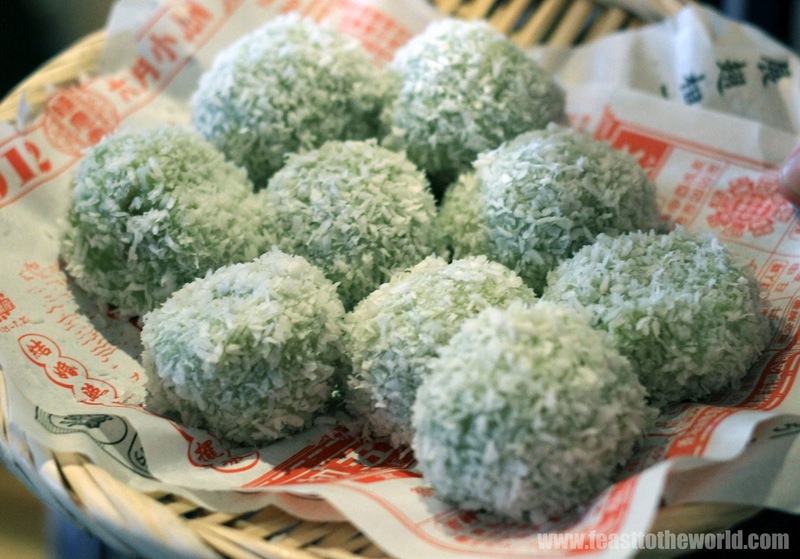 Texture-wise, they are very similar to mochi but served warm. Absolutely delicious little things!